We did it! We have completed another year of drowning prevention and water safety instruction with the Chiang Mai Municipal Schools. We taught nearly 300 Chiang Mai municipal school 4th graders basic survival swimming and water safety. Once again, this year all 11 Chiang Mai municipal school 4th graders had the opportunity to receive 15 hours of water safety and swimming instruction, FREE of charge. All instruction, swimsuits, towels, goggles, and caps were paid for by CMIRC and our sponsors. This year CMIRC donated 180,000 Baht ($5,800) to this program. 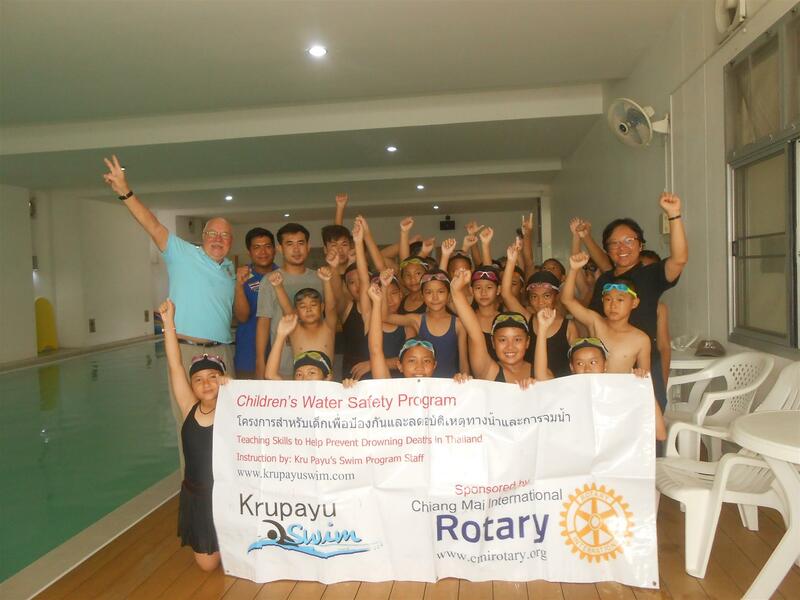 We thank our swim instructors at Kru Pay Swim, our pool at Bronco Kids Sport Center, and the Chiang Mai Municipality for their wonderful contributions and dedication to this effort! Our club remains committed to making this a part of every municipal school child’s elementary school experience far into the future! CMIRC’s work with the Children’s Water Safety and Drowning Prevention Project at the 11 municipal schools has helped us build a great relationship with those schools. So, when we heard that the Thin Thai Ngam Rotary Club was providing scholarships to needy students, we quickly agreed to help them find needy children in the 11 municipal schools. So, on March 9 at noon at the 25th Anniversary Meeting of the Thin Thai Ngam Rotary Club at the Grandview Hotel, 11 elementary school students, one from each of the Tessabon (Municipal) schools will be awarded 2,000 Baht scholarships. The children’s teachers and the minister of education for the municipal schools will also be recognized for their help in selecting these students. A perfect example of Rotary Clubs and the Chiang Mai Municipality working together to help poor children! Thank you Thin Thai Ngam Rotarians for making this possible! !